Cabo Cope is an imposing rocky headland which breaks the long run of coastal beaches of the Águilas municipality and creates a natural landmark dividing one block of wild beaches from another. The area is popular with visitors who come to see the headland and old watchtower (Torre de Cope) which was built in the 16th century to warn inhabitants of the imminent arrival of Berber raiders from north Africa, but few actually come to spend a day on the beach here. This is because it is neither large (only 40 metres in length) nor sandy, with the shoreline offering more in the way of stones and pebbles than sand, and is off the beaten track, with many better beaches on offer elsewhere in the municipality. This is very much a wild beach, so those who prefer to sunbathe and enjoy the real smell of the sea without the distraction of beach bars and thousands of people can enjoy the seclusion and silence of a little used beach such as this. As a result of its isolation, the beach is not serviced and there are no facilities. Apart from the Torre de Cope the other curiosity which lies next to this beach and its neighbour, the Ensenada de la Fuente, is the Ermita de Cope, a tiny chapel which is now semi-ruined but is a reminder of the days when only a few fishermen and shepherds inhabited this part of the Águilas coastline. 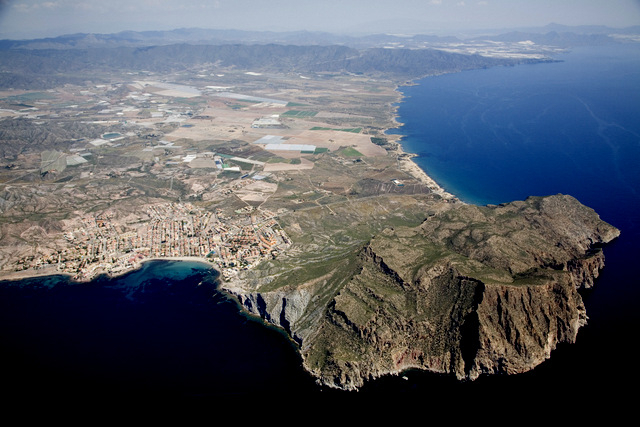 The Playa de Cope and the Ensenada de la Fuente are at the south-eastern corner of the loop of the RM-D15 road, which is reached from Águilas by taking the RM-D14 eastwards out of town through Calabardina. From the north, access is easiest from the exit at kilometre 866 of the AP-7 motorway and again taking the RM-D14 towards Calabardina before branching off on the RM-D15 after a couple of kilometres. Parking is not a problem on the rough ground near the Torre de Cope: see map for further details. 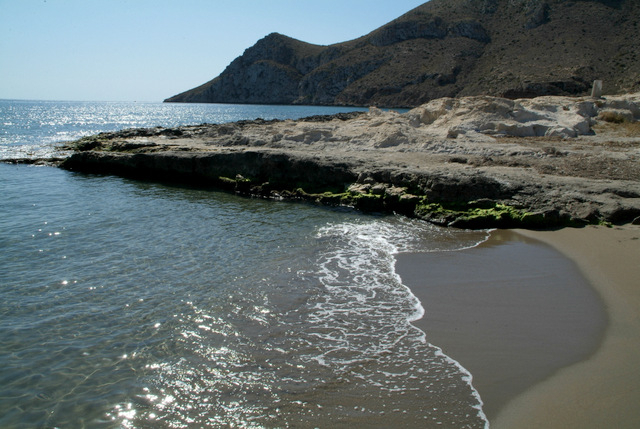 This is the twenty seventh beach in the series of 36 Águilas beaches which run along the 28 kilometres of Águilas coast, working from the Almería coastline in the west down to the Lorca municipality and offer both urban and wild beaches.